Grapefruit whipped foaming sugar scrub. Simply add a very small amount to a puff or facecloth in the shower, add water, and watch the wonderful lather appear. This makes my skin feel so soft. Works well and smells great! As always I am delighted with my purchase!I just love my fruit loops whipped scented soap! This lady is always so sweet and nice and she always customizes whatever I need!She is just a dear and a wonderful wonderful lady to do business with! Payment is accepted safely with most major credit cards through Paypal or with Etsy's direct checkout option. Sales tax is collected for purchases made in Idaho. Please note that all soap/bath and body product sales are final. Due to the nature of soap/ bath and body products, we cannot accept returns on these items, as they cannot be resold. If your order is damaged or not as described, please let use know immediately. Please read descriptions carefully before purchasing to be sure of sizes and weight. If you have any questions, please contact us before purchasing. 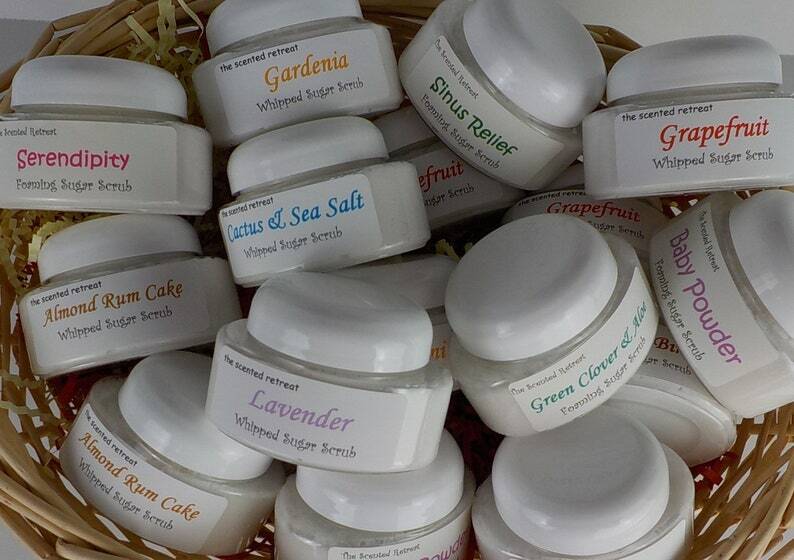 Your purchase of any of our products from The Scented Retreat means you have read and understood our return policies. Shipping is by USPS first class or priority mail to the address on your Etsy account. Please ensure this address is correct as any costs incurred for returns due to wrong addresses will be paid by the buyer. Shipping times will be as noted in each listing, though I do ship most business days so often your order is mailed sooner than listed. If for any reason there will be a delay, I will let you know asap. Custom order delivery as per listing or agreed conversations. When your order is shipped you will receive an email with tracking number and information; though the tracking is not available outside the US. The Scented Retreat cannot be responsible for package disappearance or theft after the tracking has shown delivery. If you will not be home to receive your package, we would suggest having your order shipped to your work place or pick up from the post office. Please check shop main page for any more up-to-date shipping information. • We combine shipping for multiple purchases and use flat rate shipping to save costs. As the shipping cart cannot figure out exact shipping in this case, we will refund overages of $1 or more. • For international orders we use first class or international priority. Etsy shipping cart cannot figure out exact shipping for larger orders, so we will refund overages of $1 or more once your order is processed and packed. If purchasing multiple items it is more than likely your cart will show more than actual shipping. • Feel free to send me a convo if you would like a shipping estimate before placing your order. We can also make you a custom listing and give exact shipping. Most orders within the USA are shipped in the padded envelopes. If you would like a box for your purchase, please request an invoice for additional shipping charges. The buyer is responsible for custom fees and taxes applicable to your country. Orders are available for payment and pick up locally in Meridian, ID. Please convo for details. Custom orders always available. Not all color, size, quantity, and scent combinations may be listed, so please contact us with your ideas and questions.